MFI welcomes you to join us for a Pre-Lobby Day Training near you to learn how you can reach out to state representatives and senators on issues impacting families throughout the state and the nation. 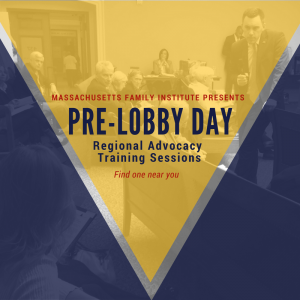 These regional training’s will be in preparation for MFI’s Annual Pro-Family Lobby Day Wednesday, March 21st from 10 a.m. to 2 p.m. in Room 428 at the Massachusetts State House in Boston. Stay tuned for more information! If you will be able to join us at one of the below locations, please RSVP to MFI’s Director of Community Alliances Michael King at michael@mafamily.org.